I’ll admit that I’m wasn’t a fan of hybrid vehicles. Although their environmental impact is admirable, they typically lack the power and visceral appeal of cars with traditional engines. Hybrids seemed too quiet and docile to share the highways with pick-up trucks, SUVs, and Harley Davidsons. Therefore, I leaned more heavily towards Detroit muscle than foreign car fuel-economy. 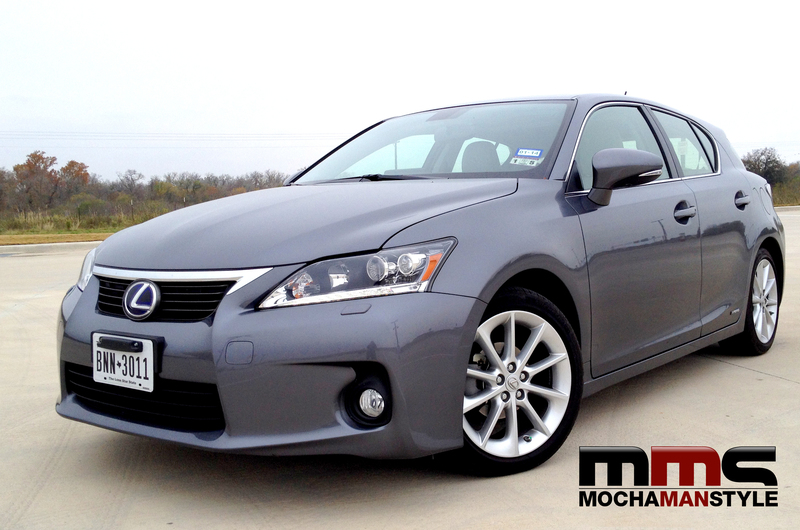 That was until I drove the Lexus CT 200h (Starting at $32,050). This car is socially responsible while remaining a bit rakish. If James Dean were a member of Greenpeace, he would have driven this car. With dynamic handling, a stylish exterior and a tech-heavy interior, the CT 200h made me think differently about hybrids. I stepped in the car and I felt like l was entering the coolest video game ever. The futuristic dashboard houses the control panel for Lexus Enform which includes live, 24-hour navigation assistance, emergency services, mobile apps, satellite radio, and real-time traffic and weather information. The joystick controls (the 2014 version has voice-control), body-hugging seats, and back-up camera made the interior feel even more game-like. I synced my iPhone via Bluetooth and prepared to hit the road. One of the Lexus CT 200h’s cool features is the Drive Mode Select. There’s ECO mode to satisfy your inner tree-hugger. In NORMAL mode, the CT 200h is a sensible hatchback that’s good for going to the grocery store. SPORT mode, however, unleashes the beast within. I found a secluded back road and floored it. Within a few seconds, I had pushed the speedometer past 100. It was an exhilarating thrill ride that I never expected from a hybrid. With my need for speed satisfied, I decided to test the fuel efficiency by driving from Houston to San Antonio. I located Backspin on SiriusXM, set the Drive Mode to ECO, and headed west on I-10 West for 200 miles. I made it all the way to San Antonio without having to refuel the car. However, I did make a pitstop at Buc-ee’s to refuel my body with a BLT and cherry limeade. If you’re ever in Texas, do yourself a favor and stop at Buc-ee’s. It’s the best store for travelers in the country (Trust me. I’ve been to 40 states and nothing compares). I spent the night at The Westin La Cantera Resort, one of Travel and Leisure magazine’s “500 Greatest Hotels in the World.” When I parked the car to check-in, a twenty-something guy, who was standing outside with a cigarette in his mouth, asked me what kind of car it was. I told him is was a Lexus CT 200h and he chuckled. “I didn’t know Lexus made cool cars like that,” he said. I let him look at the interior and check out the tech inside. He was impressed. Later that night, I grabbed some Puffy Tacos at Los Barrios and listened to some live music at Luna. At each stop, I got a few stares and comments from patrons who were smitten by the Lexus CT 200h. I woke up early the next morning to drive back to Houston. Although I was tempted to see how fast I could get home, I exercised restraint even when the guy in a Ford Focus pulled up beside me and revved his engine (BTW – I’m confident that I could have taken him). After driving the Lexus CT 200h, I have a new appreciation for hybrid vehicles. The CT 200h is a fun, fuel-efficient car that will you make you want to hit the open road. With responsive handling, a sporty suspension and impressive technology, this car is what other hybrids strive to be.